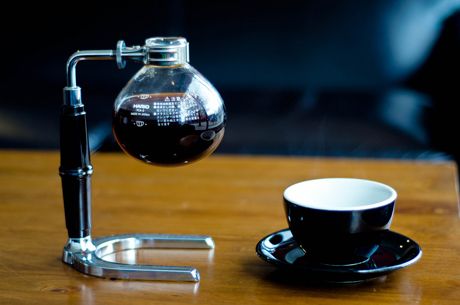 The siphon produces a soft delicate cup of coffee. This method was invented in the 1830's by Loeff of Berlin but has evolved in design, use, and functionality. We believe aesthetically this is the most stunning of all brewing methods. Soak your filter in a warm water bath for 5 minutes. Drop filter into your siphon's hopper. Fill your siphon's bulb with 350 ml of hot water. Place your entire assembly above your heat source. While water is heating measure 25 grams of coffee and grind it a little finer than your drip grind. The water should boil and go up into your hopper. Let water cool to 185 degrees. Add your coffee and softly emerge and stir grinds into coffee. Let the coffee brew for one minute and 15 seconds. Remove siphon from heat source and stir. The coffee will begin to drip back into bulb. Give the coffee a few minutes to cool.